The brand new anthology from multi-award winning editor Jonathan Strahan, featuring stories set in futures wracked by the deluge, from some the best writers in SF, including Kim Stanley Robinson, Ken Liu, Paul McAuley, Kathleen Ann Goonan, Charlie Jane Anders, Lavie Tidhar, Jeffrey Ford, and James Morrow. We stand at the beginning of one of the greatest ecological disasters in the time of Man. The world is warming and seas are rising. We may deny it, but we can't hide when the water comes. Already the streets of Miami flood regularly and Mick Jones looks more and more prescient when he sang that "London is drowning and I, I live by the river!" all those years ago. And yet water is life. It brings change. Where one thing is wiped away, another rises in its place. There has always been romance and adventure in the streets of a drowned London or on gorgeous sailing cities spanning a submerged world, sleek ships exploring as land gets ever rarer. Drowned Worlds looks at the future we might have if the oceans rise, good or bad. Here you'll find stories of action, adventure, romance and, yes, warning and apocalypse. 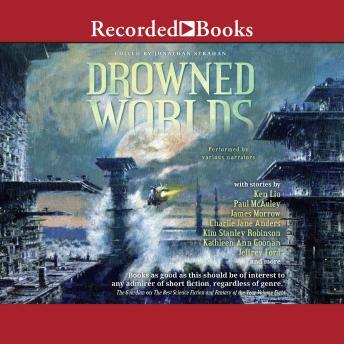 Stories inspired by Ballard's The Drowned World, Sterling's Islands in the Net, and Ryman's The Child Garden. Stories that allow that things may get worse, but remembers that such times also bring out the best in us all. Author bio: Jonathan Strahan is the multi-award winning editor of such anthologies as Engineering Infinity, Fearsome Magics, The Best of Science Fiction & Fantasy, The Year's Best Australian Science Fiction and Fantasy, and many other ground-breaking collections of the very finest genre fiction.